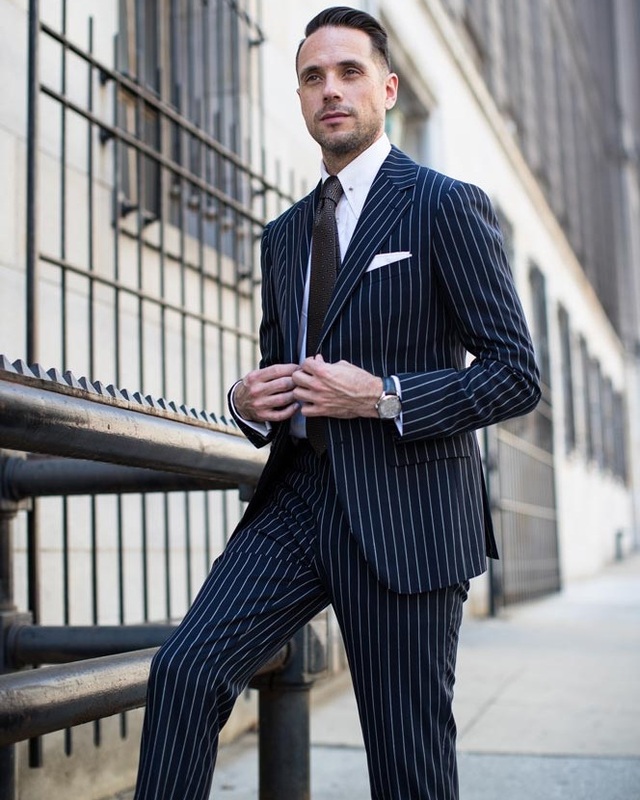 Gentlemen, some things never go out of style - like the pinstripe suit. This winter has brought us some extra emphasis on the classic look, so it's time to for an upgrade. Let the new year push you to make the more stylish choice for your wardrobe. It's time for a new staple suit that's going to make you stand out in any situation. From the board room to the party, never miss an opportunity to make a statement. Instead of your favorite solid navy suit, use your navy pinstripe suit as your staple this season. Make sure to go with a slim fitting, custom suit to look your very best. Remember the pinstripe says "power", so be sure to always pair with confidence and you'll be the best dressed man in the room. You'll want to keep your accessories simple since the pinstripe are enough of a statement. However feel free to add an extra pop of color with a bold pocket square and/or sock.